This gorgeous beach is only 3km west of Ston and offers some great swimming. Part of the beach on Prapratno cove is sandy and part rocky but all is fringed by pines and ancient olive trees. It's a sheltered beach at the back of a deep bay so the crystal waters are calm and warm. A ferry connects Prapratno with Mljet Island and there's a campsite on the beach. This beach on a calm cove is composed of smooth stones but also offers a great swimming experience. The underwater life is also magnificent and there's a diving center to introduce you to the experience. The beach is just downhill from the famous Grgich Vineyards and there are a number of cafes and restaurants along the beach where you can taste Peljesac wine. This magnificent stretch of gravelly sand may well be the best beach in Croatia. 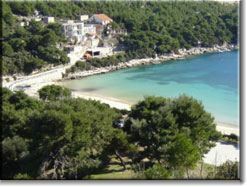 Just outside of Orebic, this long beach is lined with pine trees and equipped with beach showers and snack stands. 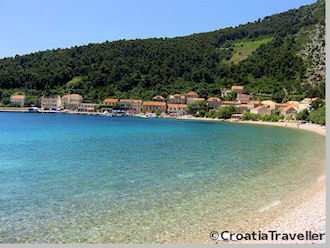 It's an easy walk from the Orebic ferry stop making it a good day trip from Korcula. The shallow drop-off makes Trstenica a great and safe beach for kids and the calm waters are well-protected from wind. It's not calm and quiet at Viganj beach which is why it attracts windsurfers from around the world. There's a little village (population 300) on the Viganj cove with a long tradition of seafaring. It's worthwhile to check out the houses built by Viganj's prosperous sea captains. Even more scenic is the stunning view across the bay to Korcula town.